Françoise Henry was the foremost exponent of early medieval Christian art in Ireland in the twentieth century. She was, however, not Irish, but was born in France in 1902, and studied under famous medieval experts, particularly Henri Focillon and Henri Hubert in Paris, who furthered her career by getting her a position in the French Museum of National Antiquities in Saint-Germain-en-Laye outside the French capital. She first came to Ireland in 1926, and her fascination with the stone High Crosses at Ahenny and elsewhere in Tipperary and Kilkenny encouraged her to do a doctoral thesis on Irish Early Christian stonework which was published in two volumes in Paris in 1933. That was the first of her many major contributions with which she adorned her research on early medieval art in Ireland. At first her articles appeared in important French journals and in the French language, but throughout her life she was able to write in an imaginative and masterly fashion in both French and English. In 1932 she joined the French Department in University College, Dublin, whose President,Denis Coffey, invited her two years later to establish a course on European painting in the ‘Purser Griffith lectures’, during which she was able to fill in a sorely-felt gap in Irish third-level education and establish herself as a young voice that deserved to be heard more loudly. Initially, it was the West of Ireland which grabbed her attention, for it was there that she found ‘Celtic’ designs on stone pillars which she probably envisaged as the last outpost of the so-called La Tène art which had largely died the death on the Continent with Caesar’s invasion of Gaul. While her heart was in Ireland during the 1930s, it was the threat of German invasion of France late in the decade which brought her to take leave of absence from her job in UCD and lured her back to work on behalf of her homeland. She was heavily involved in transporting movable antiquities from Saint-Germain to a castle in the Loire Valley in 1939, and she subsequently became an ambulance driver while, at the same time, working with the Vaucher Commission set up to safeguard the cultural heritage of France – and Europe – as a consequence of the ravages of war. Despite the carrot potentially dangled before her of becoming the Director of the Museum (a plum which World War II had denied her), she decided to leave the French Museum in 1946, and came to spend the rest of her working life in Ireland. She was integrated again into UCD in 1948, but only in a subsidiary role in the Department of Archaeology, and it was not until 1965 that she was finally granted a Department of her own, specialising in the history of European art. Thereafter she spent many valuable years teaching a nest of students before she retired in 1974, and returned to Burgundy where she died in 1982. Her publications on Irish art, archaeology and architecture span more than half a century from 1928 to 1980, all of which have been usefully summarised in the recently-published Volume 117 of the Proceedings of the Royal Irish Academy, bearing a copy of her portrait on the front cover. Her earliest work was in French, discussing the iconography of Irish High Crosses, and was followed by two books, one on early Irish sculpture and the other on prehistoric tombs close to the area where she grew up in Burgundy. Further studies in French and English covered the European use of enamel decoration on metalwork, which brought her to examine the same motifs which she found on stones in the West of Ireland. It was this interest which led her to start excavating on the Mayo island of Inishkea North in 1938, photos from which are illustrated here. 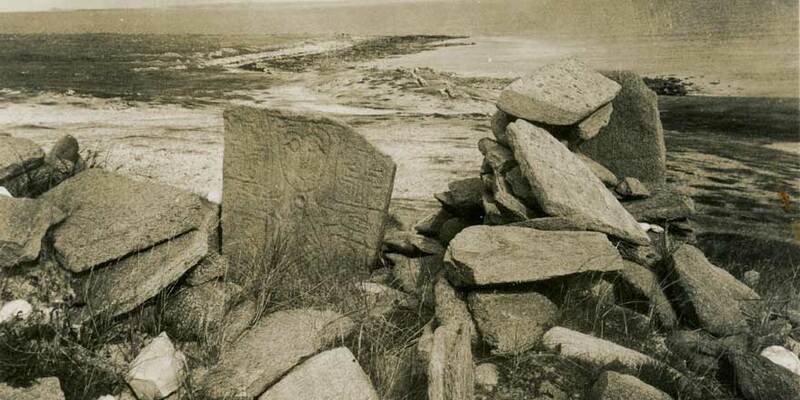 The only decorated stone on Inishkea South, Co. Mayo, as seen (left) complete in the Françoise Henry photograph of 1937 (RIA) and (right) half-damaged as seen by David Cabot in 1961 (reproduced with his permission). It is now sadly just a collection of fragments lying recumbent on the ground. A pity she didn’t send it with two others from Inishkea North to Dublin in 1938! Two years later, the London blitz didn’t prevent the appearance of her first important book in English, Irish Art in the Early Christian Period. In it, she brought out the interaction between metalwork, manuscripts and stonework, which formed the basis of much of her subsequent publications. The most important of these were the three volumes on Early Irish Art, which were first published in French in 1963-64, and later in English in 1965-70. Where earlier she had had to content herself with black-and-white illustrations, here she could luxuriate also in beautiful colour plates, lovingly created by her French Benedictine publisher, the Zodiaque series. This trio of volumes, particularly when translated into English, cemented the reputation of Françoise Henry as the leading authority in the broad fields of early Irish art ad architecture, and it was appropriate that the appearance of the first of the English-language volumes coincided with her being given her own Department of the History of European art in UCD. In addition to a number of smaller volumes on various Irish topics, which came out in the 1950s and 1960s, her last magnum opus was The Book of Kells, where she worked out the different hands that went into the making of Ireland’s greatest painted masterpiece, and prepared her own notes and line drawings for it. Again, it is one of the coincidences of her career that in the year when her Kells volume appeared, she was not only presented with a Festschrift, a series of essays in her honour in the Jesuit magazine Studies, but also the year she retired from UCD to return to her native France to spend the remainder of her life in her Burgundian homeland. Françoise Henry’s excavations and publications on the island of Inishkea became the subject of renewed interest six years ago, when two versions of her diary – one in French edited by Barbara Wright, the other in English edited by Janet Marquardt – gave her elegantly-written private thoughts on her experience of digging on the island. They certainly help to keep the memory of her work alive, as do also the three volumes of her collected essays assembled by the Pindar Press in London between 1983 and 1985. Our exhibition Françoise Henry and the history of Irish art will run until 29 June 2018.